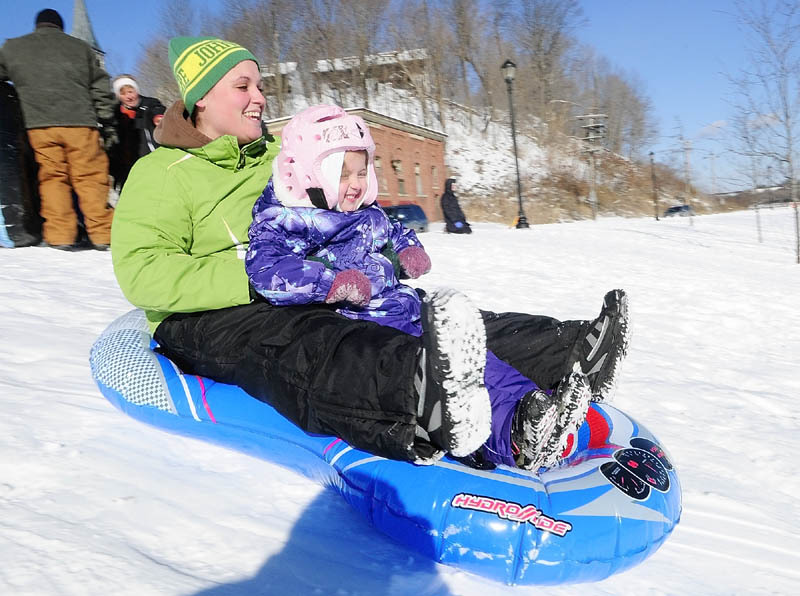 Kelsey Morin, left, and her daughter, Hadleigh Morin, 4, both of South China, slide down the Mill Park sledding hill on Tuesday in Augusta. There were several groups of sledders there on the New Year's Day holiday. The sledding hill is near corner of Northern Avenue and Canal Street, between Sand Hill and downtown Augusta. Kelsey Morin, left, and her daughter, Hadleigh Morin, 4, both of South China, slide down the Mill Park sledding hill on Tuesday in Augusta. There were several groups of sledders there on the New Year’s Day holiday. The sledding hill is near corner of Northern Avenue and Canal Street, between Sand Hill and downtown Augusta.